Many Jamaican animals can be found in Jamaica and nowhere else in the world. We describe these as being endemic. And sad to say, many of these animals are endangered, having been the victims of natural and human interference. We have our fair share of domestic animals, most of which were introduced from other countries (mainly Spain) during the time of European colonisation. Common pets are dogs, cats, ornamental fish and birds. Animals raised for food are chickens, pigs, cows, goats, fish, and to a lesser extent, sheep and rabbits. Horses are bred for racing, and donkeys and mules are used for work, but on a very small scale. 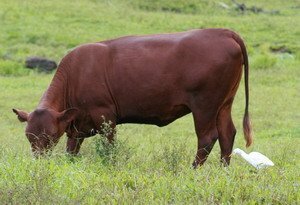 The Jamaica Hope, Jamaica Red Poll, Jamaica Brahman and Jamaica Black are four breeds of cattle adapted to tropical conditions. They were developed in Jamaica by Dr. T.P. Lecky, a Jamaican scientist. Jamaican wild animals range from large reptiles to small birds and miniscule insects. Many of these species are protected by law. Here are some pictures of Jamaican animals taken by my kids and me. There are seven species of snakes which are indigenous to (found naturally in) Jamaica. Of these, six are found nowhere else. Although none of the species found in Jamaica is harmful, snakes are often killed on sight out of fear. Three of the species are known as Grass Snakes. The Jamaican Boa (Epicrates subflavus) is the largest of the seven species, capable of reaching over six and a half feet in length. It is known as the Yellow Snake (or Nanka), and has a beautifully patterned black and yellow body, with a small tapered head. It is found in remote areas of some parishes. The Yellow Snake rests in the day, coming out at night to feed on rats, bats, birds and eggs. The young feed on smaller animals, such as lizards and insects. Because the animals are secretive and nocturnal, they are rarely encountered by humans. They give birth to as many as 18 young at a time. Snakes used to be much more common in Jamaica, but the clearing of land for farming and housing has resulted in much of their habitat being lost. The mongoose, which was introduced into the island in 1872 to destroy rats in the canefields, is also to be blamed for reducing the snake population. The Jamaican Boa is a protected species. The American crocodile (Crocodylus acutus) is Jamaica's largest reptile. It is not endemic to Jamaica, as it is also found in the coastal wetlands of Cuba, Hispaniola, the Cayman Islands and Florida. the Black River in St. Elizabeth, where it estimated that a population of about 300 exists. 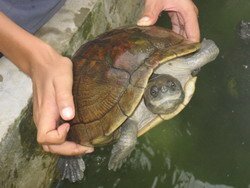 They eat mainly fish and other small aquatic creatures like frogs and turtles, but will sometimes catch birds and small mammals that happen to be in their habitat. Crocodiles lay eggs, breeding and nesting between March and August. The female crocodile becomes aggressive (like all mothers!) during the nesting period, but otherwise crocodiles tend to be quite shy, and merely submerge or retreat when they are disturbed. This gentle aquatic giant is commonly referred to as the Sea Cow, due to the large size it attains as an adult. Manatees (Trichecus manatus) are warm-blooded herbivores that live in shallow waters, which may be salty, fresh or brackish. They can grow up to 12 feet, and can weigh over 3000 pounds. Manatees are grey in colour, blimp-shaped, with two small front flippers and a flat tail. Females give birth to a single calf at a time. The animals live in herds of three or more. Getting caught in fishing nets, and being deliberately killed for meat are the greatest threats to these docile Jamaican animals. As a child, I heard the manatee described as having seven different meats! Manatees are endangered worldwide, and the Jamaican population is thought to be extremely small (definitely less than 100, but possibly less than 20). Those that remain are found mainly along the south coast. A few can be seen in semi-captivity at Canoe Valley in Clarendon - if you're lucky, they'll surface right beside your boat! Manatees are protected in Jamaica by law. The Jamaican Iguana (Cyclura collei) occurs nowhere else in the world. It was thought to be extinct until 1990 when a hunter found one live in the Hellshire Hills in St. Catherine. A small population was found to exist in that location, and a resulting project saw eggs being collected and hatchlings raised successfully at Hope Zoo in Kingston. The animal feeds mainly on fruit, plants, flowers and berries. It is described as rock gray (the ones I've seen look brown to me! ), and can reach up to 5 feet in length. It has scales, and spines which run along its back and its head. These Jamaican animals are protected by law. The Jamaican Hutia (Geocapromys brownii) is another of our endemic Jamaican animals. It is commonly called the coney. It is a small, squat rodent ranging in colour from reddish brown to black. It grows up to 18 inches in length and can reach a weight of over 4 pounds. In the time of the Tainos, the coney was a popular and abundant food source. At the present time it is found only in remote hilly limestone areas where many natural crevices and tunnels occur. The fact that the animals are nocturnal make the chances of a coney encounter even more unlikely (I don't know anyone who has actually seen a coney in the wild). The largest known populations are in St. Thomas and Portland. Studies have revealed that conies live in family groups ranging from 2 to 10 in size, enjoy physical contact with each other, and have fairly long lives. They give birth to 2 pups twice a year, and feed on roots, shoots, fruit and bark of different plants. Like other protected Jamaican animals, its numbers have declined through habitat destruction and the introduction of the mongoose. The number of conies has also dwindled due to hunting. Close to 300 species of birds have been recorded in Jamaica, of which about 30 are endemic. Most of our birds are protected, but there is a bird shooting season in September, during which certain game birds may be hunted. Especially close to our hearts is our national bird, the Doctor Bird (Trochilus polytmus). 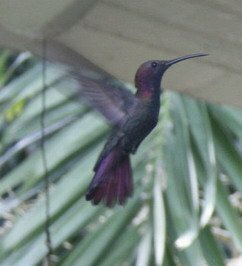 It is one three species of hummingbird found on the island, and is one of our protected, endemic Jamaican animals. It is also known as the Scissors Tail, Swallow Tail, or Streamer Tail Hummingbird, as it has two impressively long tail feathers. The vibrant green and glossy black feathers of this forthright bird make it a sight worth seeing. The Black-Billed Parrot and the Green-Billed Parrot are two other beautiful birds which are protected by law. They are found mostly in the high elevations of eastern parishes. They feed on fruit, nuts and berries, and play an important role in seed distribution. The Jamaican Owl (Pseudoscops grammicus) is unique to the island. It is also known as the Patoo (Patu) or Brown Owl. Like other owls, it is nocturnal, with an eerie ability to turn its head until it seems to be facing backwards. Many people associate these Jamaican animals with the supernatural. The most magnificent Jamaican butterfly is the Giant Swallowtail (Pterourus homerus). Found only in Jamaica, it has a 6 inch wing span, making it the second largest butterfly in the world. It is found mainly at high altitudes in the Blue Mountains, John Crow Mountains and Cockpit Country. The Giant Swallowtail has a vivid black and gold colouring, with dark blue circles decorating the lower wings. There are at least 134 species of butterflies and moths in Jamaica, of which at least 30 are endemic. Particularly noticeable because of its numbers, is a white/cream coloured butterfly which swarms flowering Lignum Vitae trees. In addition to the more noteworthy creatures, there is a host of other interesting fauna in Jamaica. Lizards play in our trees and in our houses, turtles swim in our ponds, tree frogs chirp throughout the night. Bats swoop out of their caves at night, galliwasps and scorpions hide in the damp, mongooses dash across the road in daredevil fashion. Open your eyes wide, and there's no telling what you may see. Fonthill Wildlife Sanctuary is a wonderful place for animal enthuisiasts and nature lovers.